5 Ways To Keep Your Warehouse Secure | Calgary Alarm Inc. Many thieves and vandals prefer to operate in darkness. Consider installing security lights, as well as motion sensor lights around the warehouse to deter potential intruders. Consider using different strategies to improve security at all entry points. For instance, you can use pass keys or electronic tags to identify the employees accessing certain areas at specific times, install bars in all the windows, ask guests to sign in, and designate outside personnel with regular access to specific sections (such as asking drivers to wait in the lounge area). Managed access control systems are great for controlling the level of access for different employees while preventing unauthorised persons from wandering into restricted areas. These systems effectively reduce the amount of traffic in certain areas, which in turn reduces the risk of theft or vandalism. The loading docks are one of the most vulnerable areas of the warehouse because they can be accessed by non-employees, such as transport personnel and other people. Consider fencing off the shipping area to prevent physical access without a check. Commercial alarm systems are vital for the security of warehouses. These systems typically comprise CO detectors and fire alarms, motion detectors, and audio and video monitoring. Make sure that the cameras are strategically installed to cover all vulnerable spots. But more importantly, you need security personnel to constantly monitor the surveillance system so they can discover incidents as soon as they happen, or identify suspicious patterns and prevent crimes from happening. 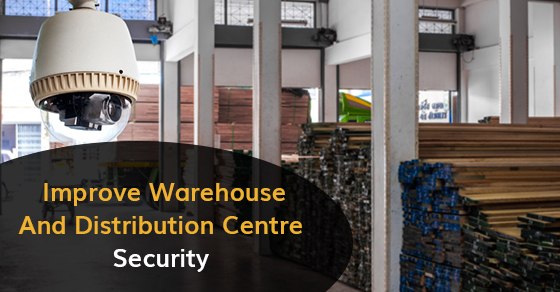 Large warehouses should consider using onsite security personnel to manage and record the arrival and departure of trucks, visitors, and employees; perform spot-checking of inventory at various checkpoints; and conduct regular security rounds. Thieves are quick to identify weaknesses and blind spots in your warehouse security system. To avoid any loopholes, it is best to seek the professional services of a company that deals in commercial alarm system design and installation. They will give you a full security assessment of the facility and recommend ways to improve on it using an integrated approach that may include an alarm system, security guards, and video monitoring, among other features.